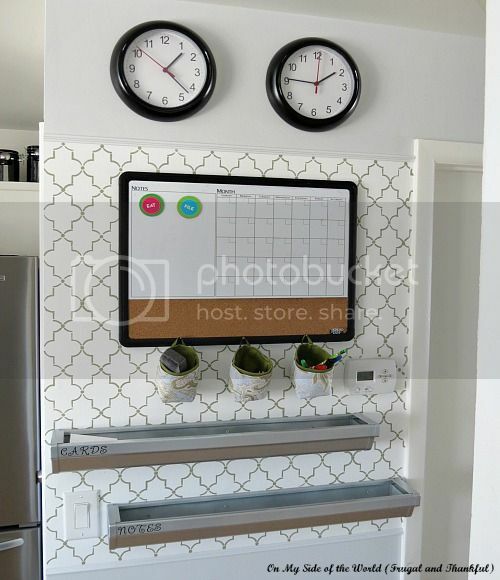 Frugal and Thankful: Finally, a finished project here... A command center #2. Finally, a finished project here... A command center #2. About a year ago I shared with you our Command center. This project is still one of the most popular on my blog. Almost every day somebody stops by that post. At some point I had a picture hanging there too but I took it off a long time ago. 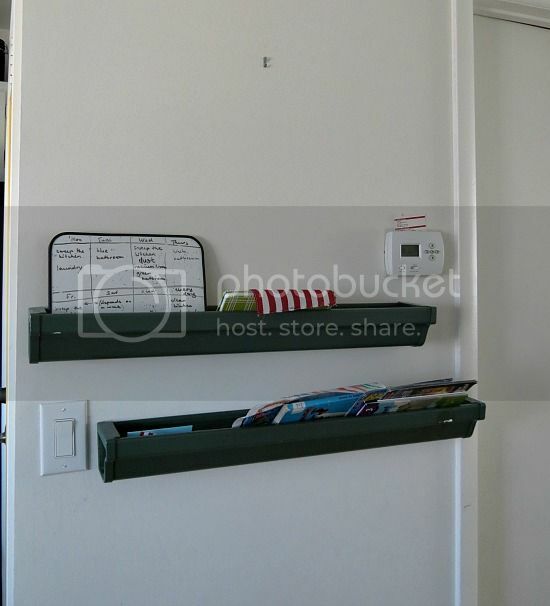 These shelves were made of leftover pieces of gutter and I loved them. So I reused them in the new command center (just spray-painted with Rustoleum metallic paint that I already had on hand and added vinyl letters). The paint was a "custom mix" (I basically mixed together some leftover paints I had on hand to get this mossy-green). Hubby then framed it for me with some thin molding that we had in the garage. I wanted to add some fabric baskets too. At first, I fell in love with these ones from IKEA. The small baskets seemed perfect! But there were only two in each set, and I needed three. I wasn't about to spend $12 and end up with three more baskets I didn't need (no, I'm not that cheap. It's all about the challenge:). The solution? Make it myself, of course! Ha, I have actually sewn something again. Can you believe that??? A little paint makes such a difference! Looks amazing. Love the stencil work. And the two clocks great idea. Using up guttering is a good idea but unfortunately our left overs this ) shaped and can't find any use for it at the moment. Hmm, I have to say, I've never seen gutters shaped like this before:) You could, probably, connect two pieces and make a fun planter for outside? I really like that you added the two clocks. Where do you have a calendar for future things? Oh, this is just for the immediate stuff my family has :) I still have my planner and a bunch of notebooks. This turned out so cute! 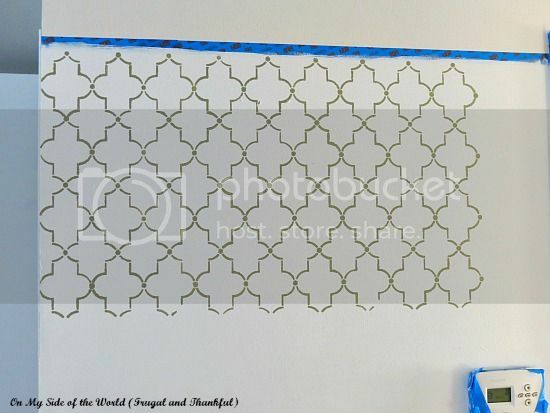 Love the stenciled wall! I love it Lena...It looks neat and modern and simple all at once. 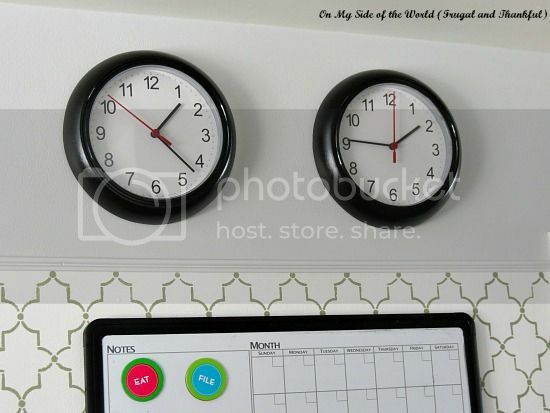 I like your idea to use two clocks. My parents are also on a different time zone, and I am calling them more and more lately because of my dad's health. It's easy to forget to do the math. Ok.. you are just all kinds of AWESOME girl!! Seriously!! Love it! Lena, that is not sad spot anymore. It is so good and truly looks like a magazine project. you did great! hope it helps with organization and such. It just looks fantastic! 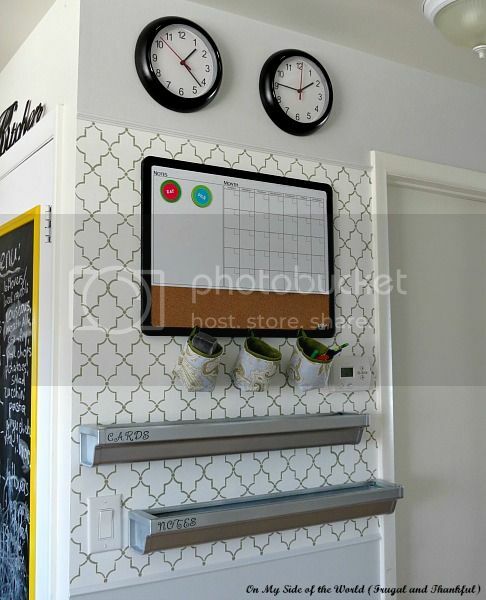 Love the whole thing, especially the clocks. 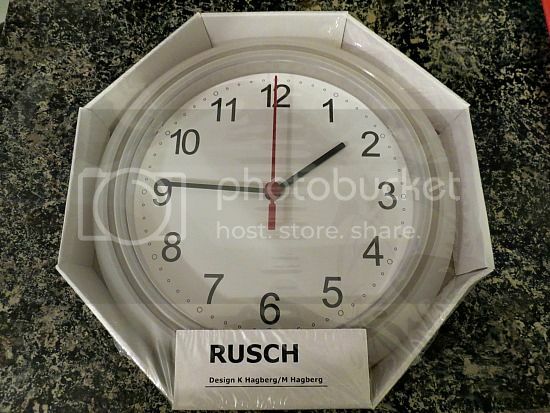 Pardon my curiosity, but is the other clock for Russian time? I am curious because there's as much as 22 min difference. It's just my OCD showing, I swear, but I love how they look. I've always liked how clocks show two different times, but never seen odd hour differences like half hours. looks great, love the stencil! Wow, this looks really great. You are so creative, I just love this idea. 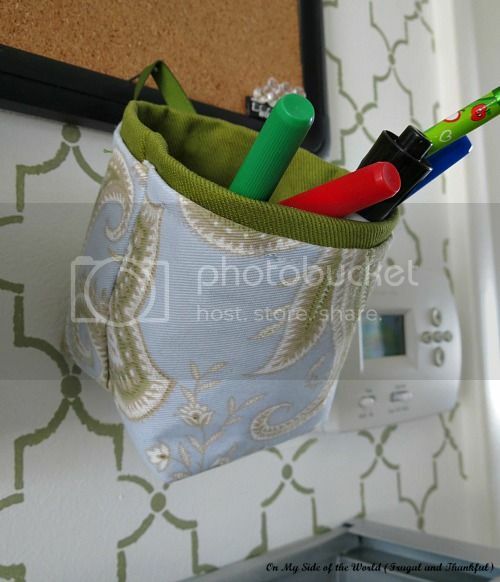 Might even do one myself above my desk in my sewing room. You really are talented! I wish you lived closer, my house needs work! Turned out awesome! Thanks for sharing at our party! Oh wow that looks great! Gosh I need to make one of those. Looks great! I have been gathering supplies to make a command center in our home. Love how yours turned out!